Sit. Stay. Check out our websites. 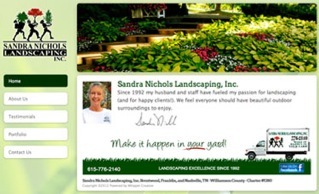 ig our newest website development for Sandra Nichols Landscaping, Inc. located in Brentwood, TN. SNL, Inc. has been creating gorgeous and practical landscapes since 1992. If you're in the Nashville area, let Sandra work her magic on your yard.